I wrote an earlier blog regarding graphics for a change, but it wasn’t quite protesty enough, so here’s a new bit about a poster by Emek. I enjoy this one because it quickly communicates a complex idea. I feel as though the visual really propels the viewer’s thoughts and forces them to question where there food is sourced from. 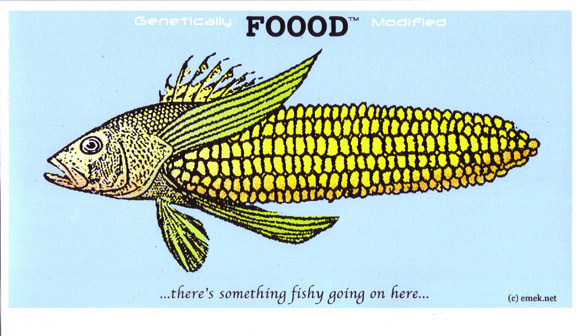 Moreso, the graphic is rather unsettling (that fish has too many fins and its tail is obviously a corn!) and rather informative (A lot of our foods – especially subsidized foods – are manufactured and manipulated forms of corn. Check out your food labels). Recently, responsibly harvesting food has been covered more in the media, but certainly not enough. I like Emek’s work because it very openly and easily states what the viewer(s) need to understand.